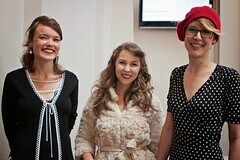 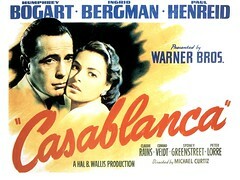 Counterpoints Arts hosted the Casablanca event at the Victoria and Albert Museum inspired by the screen classic Casablanca and the film’s themes of flight, refuge, identity, Morocco, North Africa, and piano music. 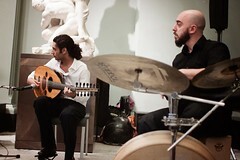 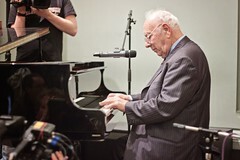 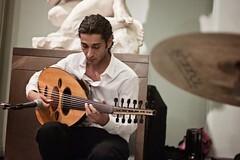 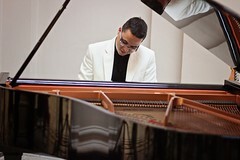 The event featured an acoustic music fantasia, with three reincarnations of Sam in Rick’s cafe on three pianos placed around the museum – featuring Jewish Algerian pianist Maurice El Medioni together with Syrian-born, London-based Iraqi musician Khyam Allami (piano and oud), Palestinian singer Reem Kelani and Sierra Leone born Alex Wilson (Latin Jazz piano) – plus dancers, sounds of souk, performance artists and interventions, workshops and conversations. 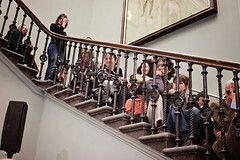 All of this brought to life the film and some of the related emotion of moral and human struggle in the extraordinary and beautiful settings of the V&A.